Britain will be the fastest growing economy of any major European nation next year, experts predict. In a boost for Chancellor George Osborne, leading accountancy firm PwC said the UK economy is likely to grow by 2-3percent, outstripping Eurozone rivals. But in a sign of coalition tensions over the recovery, Lib Dem Business Secretary Vince Cable warned that a ‘raging housing boom’ is under way in London and the South East. He called on Mr Osborne to rethink the Treasury’s Help to Buy scheme, which has been blamed by some for fuelling further demand, driving prices higher. The economy is tipped to rise above its pre-recession levels for the first time in the final three months of 2014. The deficit is also forecast to fall below £100bn in 2014/15, for the first time since before the downturn. Richard Boxshall, an economist at PwC, said: ‘There is reason to be cheerful at Christmas and many reasons to be optimistic in 2014. It does feel that the economy is really starting to gather momentum. We are expecting a good year and we are optimistic that the recovery is taking hold.’ He added that consumer confidence and the housing market are improving, and that he expects industry to begin investing again next year. Mr Boxshall said: ‘I expect as the year progresses that will help a more balanced recovery than we are seeing at the moment.’ PwC forecasts that inflation will be at 2.3percent on average in 2014, slightly above the Bank of England’s 2percent target. The accountancy firm said that 2014 will be the year when advanced economies such as the UK and the US start to ‘get their mojo back’ after the devastating financial crisis that peaked in 2008. The firm admitted that real wages will fall for the sixth year in a row, meaning that households will continue to see their spending power squeezed as their salaries fail to keep pace with rising prices. However, it said it expects the pressure on household budgets will start to ease as wages begin to catch up with inflation. PwC expects unemployment to fall by the end of next year to 7percent – the threshold set by Bank of England governor Mark Carney to start thinking about hiking interest rates from their current ultra-low level of 0.5per cent. That is two years sooner than Carney initially expected. House prices are forecast to increase by around 4pc on average next year, though home values will still not have recovered their pre-crisis highs, and will remain more than 10pc below their peak at the end of 2014. But homeowners received a double warning about a new housing bubble. 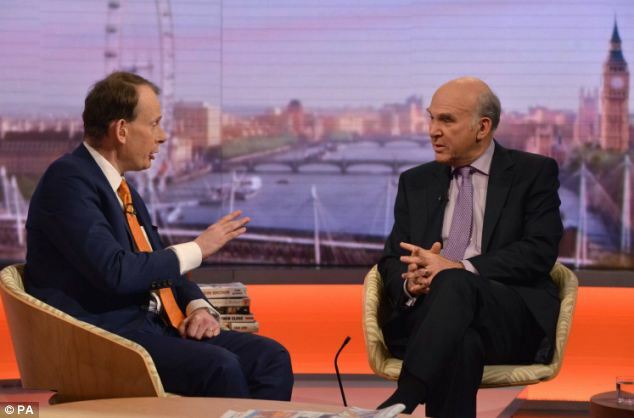 Mr Cable told the BBC’s Andrew Marr the Help to Buy scheme should be reworked: ‘We certainly need to look at that [scheme] again. It was conceived in very different circumstances. ‘There is a raging housing boom in London and the south-east, not in other parts of the country.’ Mr Cable said that raising mortgage rates to deter homebuyers would ‘hit those parts of the country which are not yet fully recovered’. But he added: ‘On the other hand if you don’t increase interest rates then of course this boom that’s taking place in house prices gets out of control and the only people who can live in large parts of London are foreigners and bankers and we don’t want that either.’ The Bank of England also pledged to step in if the property market becomes overheated again amid signs that a new housing bubble is being created. Deputy Governor Andrew Bailey said regulators would make it more difficult for people to get mortgages if the market becomes a ‘free for all’. As head of the Prudential Regulation Authority at the bank, Mr Bailey can reduce loan-to-value ratios, making products such as 95pc mortgages more expensive for homebuyers. He said: ‘We are watching the housing market very carefully.’ Mr Cable was slapped down by Housing Minister Kris Hopkins, who pointed out that just one in fifty sales in recent months have been a result of the Help to Buy scheme. Mr Hopkins said the scheme was not inflationary. The Office for Budget Responsibility forecast that there would be 3.7 billion transactions over the three years from April 2013 to March 2016, meaning Help to Buy would account for less than 2% of overall transactions. But Labour’s Hilary Benn said house prices would continue to soar unless the Government ensures that more houses are built.